A very conservative treatment for restoring teeth involves the use of dental veneers, which are also referred to as porcelain laminates or porcelain veneers. Veneers can be described as being like a contact lens that are custom made to fit over the front surface of teeth to improve several conditions. Following a definitive exam and deciding on the appropriate treatment, veneers can be prepared with or without anesthetic. Typically, the preparation involves minimal reduction of enamel. An impression is taken and sent to a laboratory to assist in fabricating the veneers. While the veneers are being made, most individuals can function and carry out everyday tasks quite well without temporaries. Veneers are typically porcelain and offer a conservation solution to changing one’s tooth colour and shape. Porcelain can offer a natural tooth-like appearance that is stain-resistant and well tolerated by the gum tissues that surround the tooth. 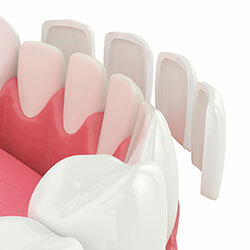 The process of placing veneers involves bonding the porcelain to the tooth. As a result, it must be noted that veneers can be challenging to repair if damaged. People can dislodge veneers with clenching or grinding or other habits such as chewing on pens, fingernails, or other hard objects. Veneers must be looked after and well maintained sometimes with a tooth appliance to provide for a long lasting product. Some alternatives to veneers include conventional bonding or crowns.